At FIFA Meeting, Israeli And Palestinian Delegates Shake Hands : The Two-Way The "handshake for peace" was perhaps the only thing that could compete with accusations of corruption and bribery that have dominated the international gathering of soccer's governing body. 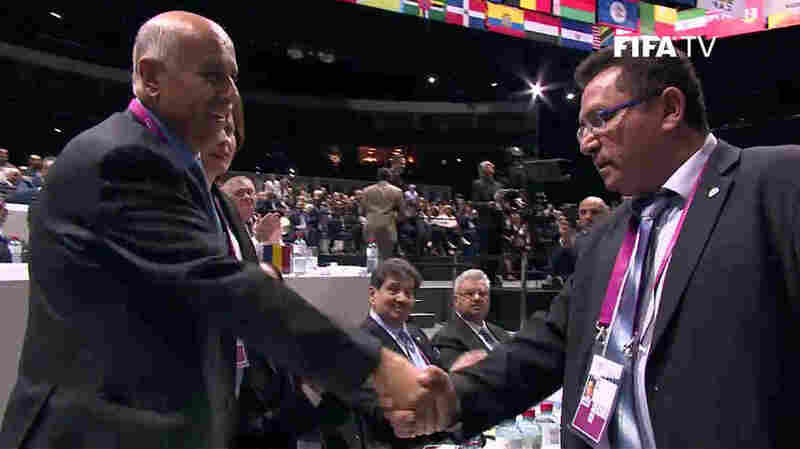 Palestinian Jibril Rajoub (left) and Israeli Ofer Eini shook hands Friday after FIFA's member groups adopted a plan to work out problems between their soccer associations. Confusion and emotion broke out at Friday's FIFA Congress — and it wasn't over embattled leader Sepp Blatter. The leaders of the Israeli and Palestinian soccer organizations shook hands. The much-discussed "handshake for peace" happened after the Palestinian Football Association withdrew its proposal that FIFA suspend Israel from international competition. It was perhaps the only issue that could compete with the wide-ranging accusations of corruption and bribery that have dominated the international gathering of soccer's governing body this week. Those allegations come as FIFA holds a vote for its presidency. Israel's Ofer Eini and Palestinian Jibril Rajoub shook hands after some parliamentarian maneuvering and impassioned speeches from both sides. "I think that football must serve as a bridge to peace — peace that we all want," Eini said. Addressing his Palestinian counterpart, he said: "I want us to work together. I want us to cooperate. I want us to hug and embrace each other." Eini also said they should leave politics to the politicians and resolve problems between the groups. Rajoub listened to those statements with his arms crossed. He then responded from the conference hall floor, saying: "I am ready to come and shake hands. But let us vote — make a deal." His voice rising as he responded to Eini's offer of a handshake, Rajoub said: "I am ready to come and hug you in front of everybody. I have no problem, to shake hands with you, OK? It's not an emotional issue. It's life or death for me. I am ready to say let bygones be bygones, but let us vote on the items that I raised." As our colleagues over at the Parallels blog have explained, Palestinian soccer officials have said Israel broke FIFA's rules with its policies and practices — particularly those that govern movements between Gaza and the West Bank and international travel. NPR's Emily Harris reported: "Palestinian officials say Israel blocks visiting teams, particularly from Arab nations, from competing with Palestinians on their home turf. They say Israel also puts obstacles, including taxes, on donated soccer equipment. They even say the country allows a popular Israeli team to display anti-Arab attitudes." Despite an avowed determination to see a vote on the issue, Rajoub withdrew the proposal Friday. Instead, the 209 FIFA member associations voted to set up cooperative groups to work out problems. The proposal calls for creating "a three-party working group (composed of the Israeli and Palestinian authorities and a representative of FIFA) that would meet monthly to clarify and solve issues." It also calls for introducing "football IDs" for Palestinian athletes and officials, to help speed up the process of passing through checkpoints. The proposal was adopted with support of 90 percent, garnering 165 votes.